Heat the EVOO and butter in a nonstick skillet over medium-high heat. When hot, add potatoes to the skillet. Grate the onions over the skillet with a hand held grater on the large side. 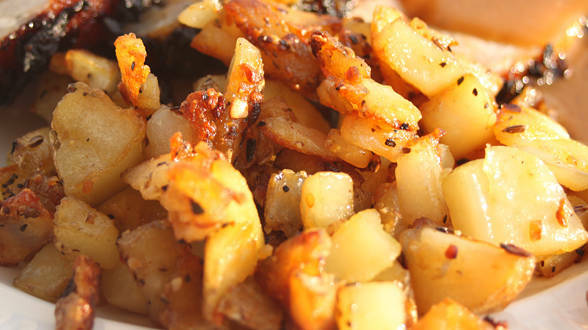 Toss the potatoes and onions to coat evenly in hot oil and butter and season with grill seasoning. Brown and crisp the potatoes and onions 6-7 minutes. Serve hot alongside chicken and egg sammies. In Recipes-list.com we have selected the most viewed recipes from category - uncategorized . Enjoy the best recipes specially selected for you! Almost-Instant Browns is the right choice that will satisfy all your claims.